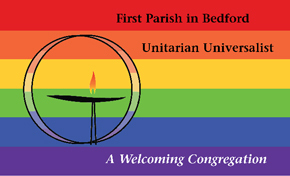 Having fulfilled the requirements of our denomination to be a “Welcoming Congregation,” First Parish is intentional about celebrating the presence and full participation of lesbian, gay, bisexual and transgender persons in all aspects of congregational life. We also welcome all persons regardless of race, economic status, theological and political perspective, or other distinctions that keep us from embracing our common humanity. We acknowledge that we still have work to do and we welcome your advice about how we may be more welcoming. We want to say, truthfully: All are welcome here!